As we start another Rotary year, let me first thank the Rotarians who have agreed to be your stewards for another year of service to our communities. Launching a new Rotary year, is like launching a great ship - The sea is said to be a teacher of truth and in sailing we find the salt of reality. Rotarians and like-minded men and women of goodwill, can come to recognize that we are one people around the earth and that we can do much to bring harmony and understanding between friends who may dwell across expansive oceans or perhaps next door. What has been accomplished before is now Rotary history. It is our time to add to our glorious history. What is said of us in the future will be determined by you and me. As one who has participated in and love sports all my life, I am a great believer in teamwork. In sports, one learns early on that teamwork is absolutely essential to a team’s success. An individual star will not assure victory unless there is coordination, cooperation and a team spirit among the players. So is teamwork vital to Rotary. Rotary cannot achieve complete success without the participation and cooperation of all members of the team. 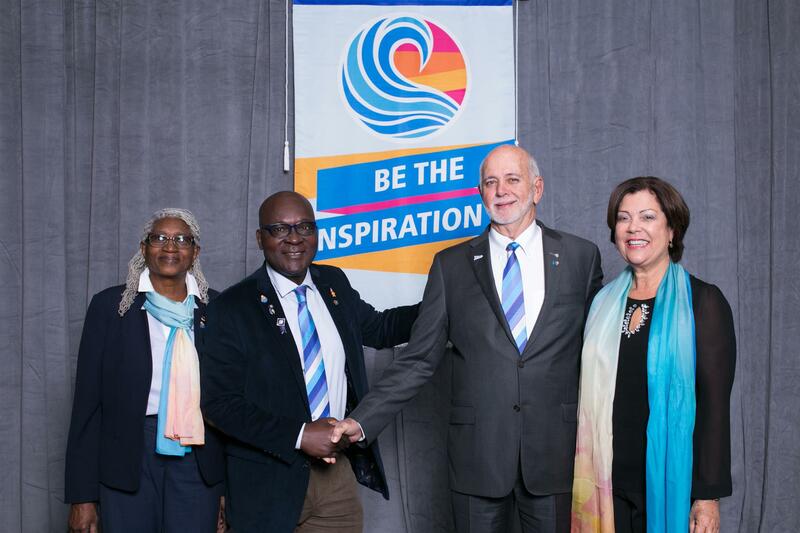 The 2018-19 Rotary International emphasis is “BE THE INSPIRATION” and this is reinforced by our District 7020 theme of “SHARE YOUR LOVE FOR ROTARY”. We are leaning heavily on empowering our young generation. If we want to see another century of Rotary, we must make Rotary attractive to young people. Many young people share our beliefs. To get them involved in Rotary, we must concentrate on activities that capture their attention, so they are willing to make a commitment. It is not the responsibility of young people to come to our clubs. It is ours to invite them. The spirit of Rotary is not exclusive; it expands. It is not local, it is universal. It is the wish to understand and be understood, to see virtues rather than faults in others, to find what we have in common rather than what divides us. It is that unity of desire and a unity of purpose to serve society and to serve mankind...a unity in diversity that binds us Rotarians together. Through service, we become more tolerant of our differences and more grateful for the people in our lives. Our sense of gratitude drives us to understand others better and to see the good in everyone. Through our Rotary service to humanity, let us make a difference to the world around us which in itself will be an inspiration, not just to our members but to the world and communities involved. “I have learned to give, not because I have too much, but because I have known the feeling of NOT having"